That's pretty awesome. Makes me smile! Love the magical details so much at Disney- like this! What an amazing picture! It just reminds you of Disney's attention to details and always remember to look up! Up, up and away! Your Disney photography is stellar KJ! Great shot! That's one of my favorite places. Love the land and the Sunshine Seasons, I miss the time when these used to move. Thanks for sharing! One of my favorite details of the Land Pavilion! Love looking at all the decoration on the ceiling at the Land pavilion. Great shot. Great shot! 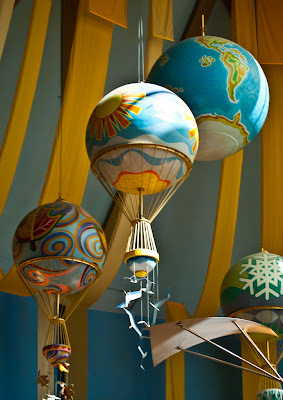 I love looking up at all the balloons in the Land Pavilion when I'm eating at Sunshine Seasons. Thanks for bringing back some happy memories. And now I want strawberry shortcake from Sunshine Seasons! Perfect August picture! Rushing to get your Soarin FastPasses I wonder how many miss these beautiful balloons? Love them...thanks for this!